Not much longer before Vienna cleans up and stores its terrace furniture for winter. It becomes, therefore, urgent to quickly find the best of the people watching terraces in anticipation of a late-fall afternoon coffee or Radler. Of all the places that I visit, this one is the closest to the epicenter of tourism in the 1st district. 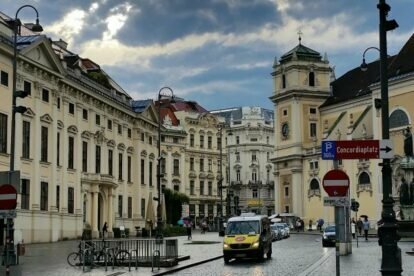 The Stadtcafe is located at Freyung 1, smack in the middle of the beautiful ancient Freyung square in the 1st district. It is directly next to the opulent Palais Ferstel Passage and across from the beautiful Schottenkirche (Scottish church). The major driving point of the Stadtcafe is this amazing location. For the leisure sport of people watching, it gets no better within city limits. Where Stefansplatz is too crowded and bizarrely cramped, Freyung is open and free. Where Schwedenplatz is dirty and has no outdoor seating, there is usually a spot open here. And if one is sick of people-watching tourists, Freyung is just far enough away to get a good mix of locals coming in from Schottentor. The Stadtcafe’s waiters are friendly and very multilingual and the food is decent. It is somehow secondary though to getting lost in thought, gazing across the square or at the fountain and forgetting where and when you are. For 20 minutes, this is one of the more beautiful places in an already beautiful city.